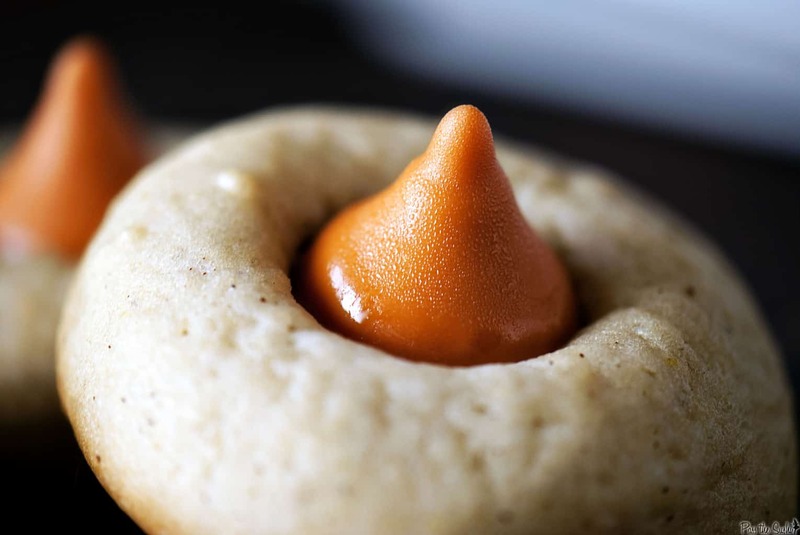 Chai pumpkin spice thumbprints are tiny cookies with great big taste! Flavors of pumpkin and chai pair with soft, chewy cookies to make the perfect fall treat! Oh boy, have I been holding out on you. Pause, now re-read that last sentence with a liiittle more enthusiasm. Because I’m not lying and the moment I saw these Pumpkin Spice Kisses, (currently labeled Fall Harvest Kisses for those shopping for them) I just had to have them. (Then I got them home and had to figure out what to make with them). After a little debate, my answer was to plop those suckers down into the middle of a chai flavored thumbprint cookie. Inspired by delicious chai cupcakes, and some of the ingredients from that recent chai pie recipe. Sure we all love a steaming hot latte this time of year, but let’s be honest. We love chai and pumpkin in pretty much everything from August until January anyway, so a new cookie recipe isn’t thaaaaat unnessecary. Plus, these are easy, fun and a breeze to transport to the office cookie exhange. Little bites of chai pumpkin spice latte on the go. I say win win. This has been year after year one of my most pinned recipes from this site with hundreds of people trying this recipe! Just in case you are looking for some more holiday or cookie or maybe even something savory for the season, be sure to check out the recipe archives and subscribe for more deliciousness right to your inbox! I knew these chai pumpkin spice thumbprints would come together nicely. Forget the classic pumpkin pie at your Thanksgiving feast this year and throw chai pumpkin spice thumbprints on the table instead. And come together nicely they did. Combine the butter and sugar in the bowl of your stand mixer and cream at medium speed until fluffy, or with a hand mixer, for about 2-3 minutes. Add the egg, chai concentrate, and the vanilla, mix until combined. Add the flour, baking soda, and salt, scraping down the sides of the mixing bowl as necessary. Using your hands, roll the dough into 22 to 24 1 inch round balls. Place the dough balls on parchment paper lined baking sheets and sprinkle chai spice mix lightly over cookies. 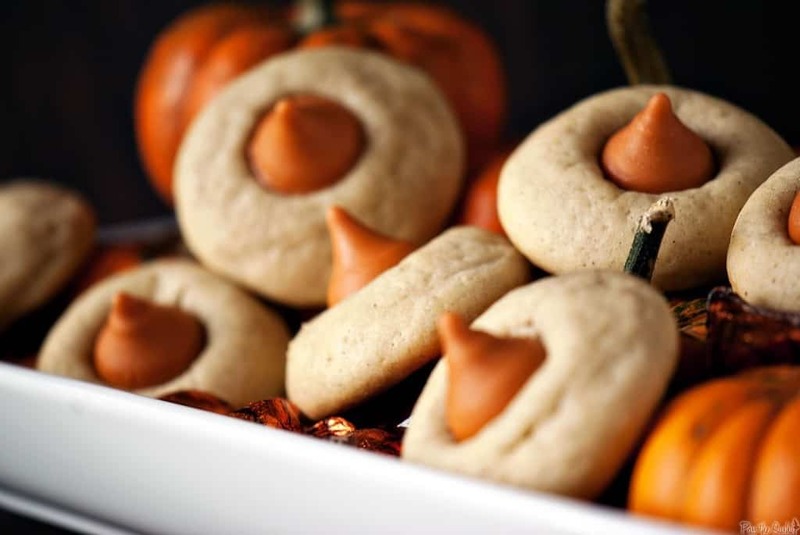 Remove the cookies from the oven and immediately place pumpkin kisses in the center of each cookie. Don’t touch or the kisses will turn into puddles! Cool completely. Wow!!! Have to pin to make soon. I love these cookies & your cookies. Chai tea is my absolute favorite! Thanks! Amazing! These flavors sound perfect together. These are similar to a cookie I made with these kisses – I wait all year for them to come out! Love the combo! Worth holding onto…what a find! 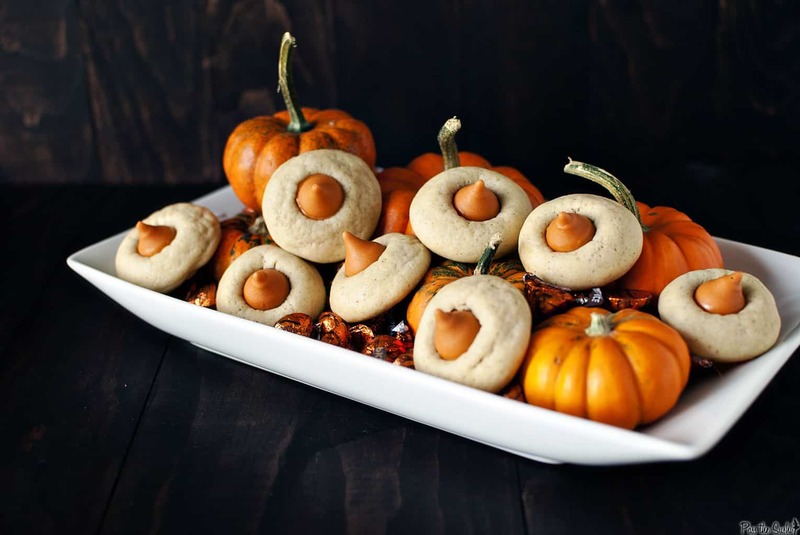 I LOVE this fall twist on a perfect cookie. I love those kisses! They never last long enough to bake with though. 😛 I need to hide a bag so I can try these – I’m a sucker for anything chai! This is such a fun twist on kiss cookies!! I’m honestly not sure if I ever saw those in the store or not though. Those look awesome! I have never seen “kisses” like that. How awesome. I love their color! Not only are they tasty looking AND sounding, but they’re mighty pretty too! Pinned for sure. Great photo! Holy cow, these look amazing. And how have I missed the pumpkin spice Kisses at my grocery store?! I’d better find some asap. Great pictures, too! Nom! I want 1. Or 7. I’m a little scared to buy these kisses for fear of eating them all immediately! I was in a frenzy to find these and when I did, like you, I had to pause and think of a special way to use them. I chose a pumpkin pie-spiced chocolate cookie as my base, but I like the way you think. Mmmm… chai. I bet these are phenomenal! Oh I had nearly forgotten about chai and you made a cookie out of it! With pumpkin kisses! I didn’t even see these, but then again I haven’t been in the candy section much lately. 🙁 You are incredibly creative, my dear! I’m currently eating a handful of these Kisses that we have at work and am so sad that they aren’t surrounded by a chai cookie 🙁 See how you are. Torture it tell you!! My kind of cookie here, Kita! I love chai flavoring, especially in baked goods. These sound wonderful! I don’t see where the chai was incorporated in the recipe. Sorry about that! I’ve updated the post. Okay, I didn’t know Hershey’s made pumpkin spice kisses. And what a great use you’ve put them to! Delicious. Where have I been that I have yet to hear about the pumpkin spice kisses? These cookies are super cute and I am sure they taste fantastic too. I need to be on the look out for the kisses! Chai and pumpkin are two of my very favorite things in the whole world. Looks like a winning combo for a cookie. Absolutely genius! Where have these pumpkin kisses been all my life. Again, you are a foodie genius to pair these with chai cookies! these look adorable. I love kisses cookies. you should live closer. That would be soooo great. Then I could run over and get a cookie from you. brilliant! Wow – these are absolutely stunning! You HAVE been holding out on us! Those look so good! I love pumpkin tea, so this should be awesome. I like how everything is Chai-licious all of a sudden. Why not? Delicious!!! I love chai and have been wondering how to incorporate it into more things.. And your photos are beautiful as always! Sorry, but I’m a little confused: do you use the whole egg or just the yolk? The instructions sound like you use more than one egg yolk, but there’s only one egg in the ingredient list. Oops! Its just one whole egg. Sorry about that. I want to make these so bad, they look incredible! But I can’t find the pumpkin spice kisses anywhere 🙁 I’ve looked at Target and Walmart so far with no luck. I saw them on Amazon but I’d rather not have to order them online.. If you have any idea of where I could buy them, I’d really appreciate it! Im sorry 🙁 I got mine at Target. I had never seen them before so I am not sure if its something only they carry. Oh these are so cute! I love the pumpkin kisses, I need to find those! If I wanted to pre-make the dough, how many days do you think it would last in the fridge? I would think these would be ok, wrapped in plastic wrap for at least 2 days in the fridge. Hope this helps! Oh my! I need to go find those Hershey’s Kisses!!!! YUM! I made these tonight and, honestly, I was a little disappointed. I double-checked my ingredients and had done everything correctly, as far as I can tell, but the cookies seemed very bland in flavor and the texture was a bit dense. I had high hopes because the flavors sounded so good together -sparked some inspiration in the kitchen! May go back and try to mess with the recipe a little bit. After reading a few comments about the cookie tasting bland, I rolled the balls in about two heaping tablespoons of sugar mixed with maybe about two teaspoons more or less of the chai mix we are supposed to sprinkle on the cookies. Then I baked them as directed and put the kisses on after as directed. They came out beautifully, taste great and the dough wasn’t sticky after rolling it in the sugar mixture. Also a fan of chai! Those kisses look awesome. Could you use a chai tea instead of chai tea concentrate? These make me so excited for Fall!! Hi there! I love this recipe and am so excited to try it, but I have a question about the chai concentrate? Amazon has both Oregon Chai and Tazo Chair concentrate for about the same price. Did you choose Oregon for a taste factor? I’ve never had it before, so I’m curious if there’s a noticeable difference in its quality. Thanks for sharing this amazing recipe! since last year I have been trying to find where to get these Pumpkin Kisses…ant help in Michigan? Going to make these cookies with my Pumpkin Spice Kisses! Can't wait! do you use liquid chai concentrate or the powdered version? i’ve made cookies with the powdered (such as general mills international), but i get the impression that you use a liquid form. please advise. I used liquid, https://www.amazon.com/Oregon-Concentrate-Original-32-Ounce-Boxes/dp/B003Q4TPAI/ref=sr_1_1?ie=UTF8&qid=1320856220&sr=8-1 . hi, i came across your recipe and really want to make these. i have a problem though. i am unable to find chai concentrate where i live. do you think it could be substituted with cinnamon extract or something of that sort? thanks! Delicious! After reading soe comments, I added the following….1/4cup vanilla flavored Greek yogurt with the butter/sugar, and with the dry ingredients I added 1 packet instant vanilla chai mix. Where can i find the chai concentrate? I noticed someone mentioned they used a chocolate based chai cookie for theirs…..does anyone want to share that recipe? Where is everybody finding the Chai concentrate? I’m having a heck of a time locating it. LOVED the taste, but had hard time “applying” the kisses. are you supposed to flattened the dough balls and make a thumb print in them? they were too sturdy to press the kisses in, ended up with some melting off the top. I let these chill for 1 hour in the fridge and followed the recipe exactly… The dough was SO STICKY when I tried to roll the balls to put on the pan. Why??? Half of the dough ended up on my hands! Chai is cardamom, cinnamon, pepper, star anise, and ginger. Just add your spices to taste and viola. Chai means tea. Spiced tea. Just made a batch of these. I had it in the back of my mind to check Target for the kisses. Picked them up yesterday. Yum! Went back today and sure enough the shelf was empty! Luckily there were a few bags left near the registers. They look amazing – just saw Heidi link these up and I want a dozen! Hi there! I just made these yesterday and wanted to share my experience. These cookies are beautiful to look at, but I found them to be rather bland. The cookie dough itself didn’t have much flavor, instead tasting like an unsweetened, shortbread cookie. I baked them in two batches and with the second batch I decided to mix up some of the chai spice with some dark brown sugar. I rolled the cookie balls in this sugar mix before baking, the same way you would with traditional Hershey’s Thumbprint cookies. The result was a much sweeter (but not too sweet) cookie that my family devoured. One thing to note about the Pumpkin Spice Kisses is that they have a strange, dry, waxy texture after cooking. But they taste amazing! I hope that helps! I was thinking of rolling the cookies in a sugar & chai spice mixture before baking to add some additional flavor because I also thought the first batch was more bland than expected. I also added some of the chai spice mix to the actual dough and was much happier with the taste. I’ll try the brown sugar & chai mix next time – thanks for the suggestion! For those asking, you can almost always find the Oregon chai concentrate at Walmart and other grocery stores in the coffee and tea aisle. It’s usually on the top shelf and they make a few different varieties including decaf and sugar free. The dough was superrr sticky. The cookies didn’t flatten very well, even after giving them a little smush. They did come out very biscuit like and crumbly. However, they did taste awesome, although I tweaked my recipe a bit. I added Pacific Chai spice to the mix instead of making the chai spice. I would recommend using more chai concentrate and chai spice in the mix. And for those wondering where to get chai concentrate, I know that Target has a few different brands to choose from. They will be with the coffee and teas in a carton. Thanks for the recipe! Just made these and they are great. Added 1 teaspoon(more than called for) of the Chai spice mix to the cookie dough batter.instead of sprinkling on to of the cookie. Searched all over last year for the pumpkin spice hershey kisses – finally found them this year. Very festive! Definitely like a biscuit and had issues with the dough being too sticky to form a ball. Anyone have any tips? I used the Chai concentrate (Tazo) that I usually get at Wegman’s, but also is sold at Starbucks. It has a more rich less sweet flavor than the Oregon version. I also used McCormick Pumpkin Spice instead of mixing my own Chai spice. Kissed also found at Target. I agree that the cookies were a bit dry. I was heavy-handed on the sprinking of the spice, but still they were a bit bland. I would probably the spiced into the cookie itself. I like the other comments about the brown sugar and the spice and rolling them as well! I just made these last week for my friend’s baby shower and they were a huge hit! So, I am making them again today for a bake sale! I did read all the comments and tweaked things a bit. When I refrigerated the dough, I left it uncovered so it was firm on top rather than sticky. I also refrigerated the dough in between each batch. I also put the kisses in the refrigerator so they were nice and hard. Instead of sprinkling the chai spice on top, I put a small amount in the dough mixture and then mixed the rest with turbinado sugar (sugar in the raw) and rolled the balls of dough in it before baking. I cut down the cooking time to about 11 minutes so they were softer. Don’t press to hard on the kisses…they will melt! After letting the cookies cool for a few minutes I put them in the refrigerator to set and harden the kisses. Then I stored in a covered bowl. They were delicious! The cookie has a really mild flavor but works well with the strong taste of the pumpkin kisses. I found the Kisses at my grocery store, but Target is a good place to find them. You need to buy them early in the season, when you first see them, and stock up because they’ll be gone before you know it. I froze mine so they wouldn’t melt when I placed them on the hot cookies. Because many people said the cookie tasted bland, I mixed pumpkin pie spice with sugar and rolled the cookie dough ball in the spicy sugar mixture, coating it generously. Then, I placed the sugar-covered dough balls on the baking sheet. I was careful not to over-bake the cookies because I read other reviews that said it was hard to press the candy down. You just have to move quickly. Once the cookies come out of the oven, immediately press your frozen candies into the cookie. The cookie texture is a little spongy, but you can still press the candy down. I doubled this recipe for my daughter’s marching band bus and she came home with an empty container. They loved them! I too just tried this recipe. I agree that it is a bit bland for my taste. After reading the comments, I added a bit of brown sugar, added some pumpkin spice in addition to the spices required in the dough. After mixing, I added some of the remaining spice mix to sugar and rolled the dough balls in it (read from another commenter). While this helped, the dough itself is still bland but the outside tastes great! I think next time I will use my own sugar cookie recipe, add the chai concentrate, and still roll it in the spices and sugar. If I try it I’ll update with the results! Not a bad idea, and the hershey’s kisses are delicious! Buy them in bulk! Y U M M Y!!!!! The other day I was perusing Target and stumbled upon the pumpkin kisses at the same time another shopper found them. She smiled big, and told me that she had just found a recipe for chai cookies, and couldn’t wait to try them. Made them yesterday — except my daughter and I both have Celiac Disease, so I substituted the regular flour with Jules Gluten Free (using the same measurement), and they turned out AWESOME!!! Thank you from the bottom of my Candy Heart!!!!! I love these cookies! With the previous comments I amped up the Chai flavor by adding 1/2 teaspoon of the spice mix to the dough. I also added 1/4 teaspoon to 1/2 cup sugar and rolled the balls of dough in it. I almost had enough kisses from one bag to make a double batch. Thanks for posting. These look like the perfect fall cookie. Thanks for the recipe! I made these this morning. I followed the recipe to a T, but I opened up two chai tea teabags and added them to the dough. It def. gave it the extra spice it needed. My cookies are very spongy, though. Not bad, just not the texture I was expecting. I was hoping for more of a sugar cookie texture. Anyone have any idea why it came out like this? Maybe refrigerating overnight would be better? Just got done making these and they are a huge disappointment. The taste is nothing to write home about, just an ordinary sweet taste. They lose shape while they are baking so many of them don’t look like the picture at all. Sprinkling the cookies with the spice after they are on the cookie sheet is a total waste. (And I sure would like to know how you divide 1/2 tsp. among 24 cookies.) I should have just added the spices in the dough. Basically the only thing good about these cookies is the “kiss”. I won’t be making these again! *Tip for those having trouble putting the kisses in the cookie. If you freeze the kisses before hand you have more time to push them in before they melt. You still have to be quick and not mess with them (especially after they have been in the cookie for a bit) much because they can still turn to puddles. And if you are having a hard time getting them in the dough because the dough won’t give way to make the imprint that holds the kiss, then the dough was cooked too long. It took me two tries to make these because the first time I didn’t use the right ingredients. With my first attempt, I tried to use Imperial sticks in place of the butter and I let it sit on the counter for a few days before I got around to making the cookies. So my “dough” was not dough the first time around. It was the consistency of stirred up ice cream when I put it in the fridge and it never got doughy enough for me to roll into balls. My mom and my grandma both always used imperial when baking so I didn’t think anything of it, but upon further investigation I found that the vegetable spreads like Imperial have more water content in them so that probably contributed to my very sticky dough. That and the fact I let it sit on the counter for too long. Anyway, the second attempt I bought some Darigold butter, put it on the counter a couple of hours before I made the cookies, got worried it was too soft and put it back in the fridge for about 15-20 minutes while I prepped everything else and then I started making the cookies. I found that the chai concentrate separated from the butter/sugar combo and so I couldn’t really “blend until combined” on that part. I decided this time around that I wouldn’t use my mixer as much because I was worried that over mixing contributed to the failure of the dough also last time. So I just stirred in the dry ingredients. I also included a full tsp of the chai spice mix in the dough to give it a stronger chai flavor. This time the consistency of the dough was much better. I did a little test with the dough on my hand by taking a little bit and rubbing it in circles. Last time it was like rubbing mashed potatoes (the packaged kind) on my hand. This time it stuck a little, but would lift off easily when I made another circle with my finger (I hope that makes sense). After it was in the refrigerator for an hour (more like two because I got distracted) the dough was perfect for rolling. It did start to warm up a bit and started to stick near the end, but it still worked. I baked for 12 minutes (I think I could have got away with 10 or 11 minutes) and put in my pumpkin spice kisses with no troubles because I froze them first and the combo is very tasty. The dough was tasty by itself and it was moist. I don’t really care for the pumpkin spice kisses alone, but with the cookie they are tasty and these are worth making if you can follow the directions unlike me the first time lol. I have looked everywhere for the kisses. They look so yummy! Has anyone tried using the Chai Tea Spice flavored coffee syrup by Torani or DaVinci? Just wondering if that would work – it’s pretty concentrated and might make it more flavorful. Any thoughts? Where do you find pumpkin kisses?? Made these for the holidays. The husband liked them, though I thought they were bland. The kisses also didn’t push into the dough; it seemed tough. Reading some of the other comments perhaps I over cooked them a bit. Probably won’t make again, sorry. Maybe this is a stupid question, but do you mix the concentrate as if making a chai drink? Or just put in the dry powder itself? Awesome! I hope that they turn out well for you. Love the wine cork idea for thumbprints. Did anyone have trouble finding the kisses this year? (2013). I wasn’t able to find them in the grocery stores or target. So upset I couldn’t give this recipe a try. These sound delicious! Pinning! I hope I can find the pumpkin spice kisses the next time I’m at Target! Wow! ​looks delicious. 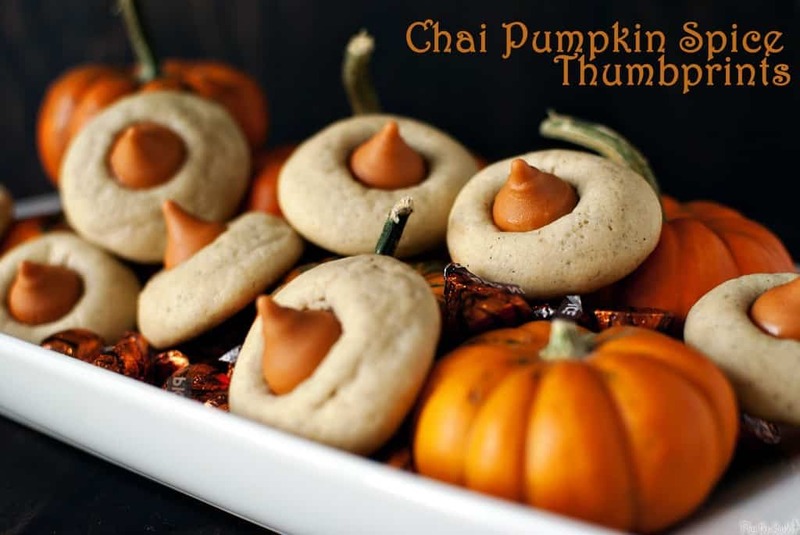 I would try making these chai pumpkin spice thumbprints​ for sure! Btw I prefer pumpkin – it may reduce cancer risk, protect the skin, boost your mood and other! Amazing chai pumpkin spice thumbprints! Combination of taste, I like a balanced diet, a variety of vitamins in it. I really like. Wow! This is fantastic. I bet they would be scrumptious chai pumpkin spice thumbprints amazing for kids. Will definitely try this for my son.